Our review of the popular Weber Q 100 gas grill (often referred to as The Weber Baby Q grill), will show you why it’s in the top group of best selling portable grills. There are many reasons to choose a Weber Q100 gas grill – and we’ll look at all of them! Do you love a bargain? The Weber Q 100 grill is competitively priced too, and we list the specific model numbers so you can choose the best on sale price for the Weber Q100 gas grill. The Weber Q 100 Gas Grill Review Video. The Weber Q 100 Gas Grill is a compact performer. 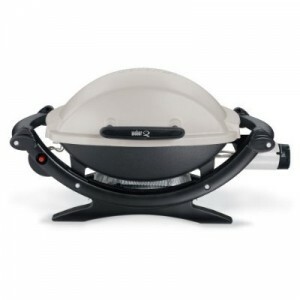 The Weber Q 100 gas grill is a popular model within Weber’s “Q” range of grills. Other models, such as the Weber Q120, Q140 (electric grill), Weber Q200, Weber Q220, Weber Q300, Weber Q320 grills have more features or are larger than the Weber Q100 Grill, but that does not mean Q100 Weber grill lacks what you need. Indeed, customers all over the world keep buying the Weber Q 100 gas grill because it’s been a great consistent performer. 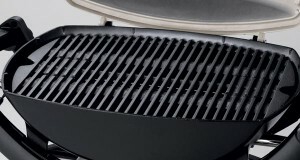 Also, Weber has ensured their reputation for high quality durable components and useful grilling features is maintained and included in the Weber Q100 grill. The Weber Q100 gas grill is a portable grill, and is capable of cooking delicious food for 1 to 4 people. The cooking area is 189 square inches. The Weber Q100 grill has its own lid, which reflects the high quality finish and heavy duty aluminum components that are present throughout the grill. The Weber Q100 grill weighs approximately 29 lbs, and has overall dimensions of 27 inches wide, by 23.5 high (lid open), by 15.9 inches deep, which means it will comfortably fit in the trunk of your car, is a good size to fit in your compartment in your trailer, or even on the back seat! The compact and handy Weber Q100 gas grill does not have any side preparation tables. If you are looking for a model which does have this feature, then you may want to take a look at the Weber Q120 gas grill (i.e. the next model up). Most customers who have purchased the Weber Q 100 gas grill have either had mobility or a smaller living space in mind when they chose this grill. The Weber Q100 grill is great for RV’s, camping, tailgating, and for those with smaller apartment balconies or yards because of its size, compactness and mobility options. This grill can be accompanied by the purchase of the Weber 6507 Rolling Cart – which significantly facilitates moving the grill from place to place, and provides a great stand at a comfortable cooking height so you can avoid having to place the grill on the ground and cook hunched over it! The Weber Rolling cart continues with the compact size features offered by the Weber Q 100 grill, since when it is not in use the cart folds down flat. 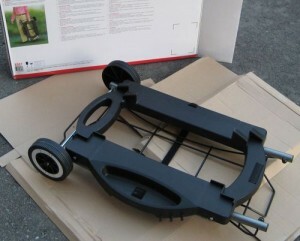 The Weber rolling cart is lightweight but sturdy, with its wings folding in during storage. It’s worth noting that the stand does not require assembly when it first comes out of the packing box (i.e. no manual for construction needed!). Overall the stand’s portability makes it perfect for tailgating. You may have come across photos of a more permanent looking grill cart for the Q Weber grills. This is the Weber “stationary” cart, but although it’s not clear on the descriptions you find on Weber’s site, or Amazon, this permanent looking cart is not suitable for the Weber Q models in the 100’s range, i.e. Q100, Q120, Q140, due to the grills’ smaller size (compared to the larger Q200 series of grills for which this cart is intended). Let’s get ready to grill on the Weber Q 100 gas grill – and fast! So, you’ve completed your journey to where you want to grill, and you’re ready to start. It’s a good job you have a Weber Q 100 portable gas grill, as you can be ready to grill quickly. The Weber Q100 grill ignites its lp liquid propane gas fuel through the push of a single ignition button that is located on the front of the glass reinforced black grill frame. It’s ok to forget your matches or lighter, as the grill has its own ignition system! Customers report it’s ready for cooking in 10 minutes or under. The Weber Q100 gas grill is served its liquid propane gas via gas cylinders or tanks. There are 3 size options for you, a 14.1 ounce or 16.1 ounce cylinder, or you can go up to a 20lb tank. If you wish to use a 20lb tank, you will require purchasing the optional extra Weber 6501 Adapter hose. Whichever fuel source you decide that works for you, do note that the gas fuel is not included with your initial purchase of the grill. 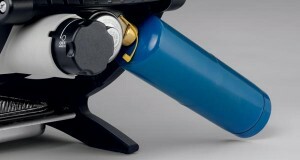 In addition, if you have selected the Weber Rolling cart stand for your grill and you choose to use a larger 20lb fuel gas tank, the 20 lb cylinder will need to sit on the ground next to the stand (and not on the bottom rack of the cart itself) or else the cylinders weight will damage the cart’s lightweight construction. Customers report that a one pound container of propane gives about 6 or 7 cookouts, although of course this depends on what you are grilling and for how long! So now you have your Weber Q100 gas grill all fired up, it’s time to get grilling on the 189 square inches of cooking grate! This porcelain enameled cast iron grate (which helps spreads heat more evenly across it) is enough for 6 to 8 burgers/pieces of chicken, or 1 to 4 guests. The durable material used to construct the grate means that those lovely sear marks on your grilled food come relatively easily. With the cast aluminum lid down, you can obtain a more consistent cooking temperature, and keep those smoky flavors locked inside the grill. This model does not include a temperature thermometer though. If you are looking for a model which does, you may want to consider the Weber Q120 gas grill. Similarly, if you love to grill whole larger pieces of meat, such as a whole chicken, again you may want to consider the same Weber Q120 gas grill, as this model has the highest/deepest lid out of all the current Weber Q grills. Take control of your grilling with the Weber Baby Q grill. In terms of the heat generated by the grill, the Weber Q100 has a rating of 8,500 BTU per hour. If you are wondering what a BTU is, you can read more about a BTU here, but essentially 1 BTU is equivalent to one wooden match lit/burning. If you are looking for a higher rated BTU, you may want to consider the 12,000 BTU pr hr of the Weber Q200 gas grill. The heat from the wrap-around Stainless Steel burner is finely controlled by the “infinite control” knob on the side of the grill, which has a smooth feel to it as you turn the dial to increase or decrease the heat. Customers like the wrap around feature of the burner because it provides a more even heat source across the cooking grate. Grill or Griddle? How about both?!! If you like grilling your breakfast, then you should consider the Weber Q 6504 griddle. This is a porcelain enameled cast iron griddle plate that fits on the Weber Baby q, Weber Q 100 and Weber Q120 grills only. The size of the griddle allows you to keep part (about one third) of the grill exposed for normal grilling in parallel to griddling (the griddle sits on top of the grill grates). 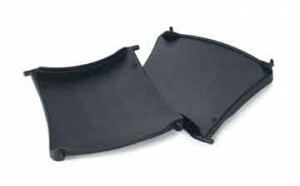 The griddle corners even have a pouring lip, which allows you to tip away excess cooking juices without losing your food. The Weber Q 6504 griddle is sturdy, and weighs approximately 9 lbs. One of the many reasons why the Weber Q100 gas grills are so popular is that the Weber engineers have worked hard to design features that make your grilling experience easier. The Weber Q100 gas portable grill is not short of these conveniences, and beneath the grilling plates you will find a removable catch pan which makes your clean up easy. Customers report that these Weber drip pans do the job well, and also comment that it’s often easier (and usually cheaper) to order extra pans online compared to buying them in store. 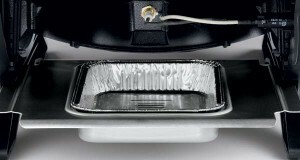 The drip pans for the Q100 are the Weber 6415 Aluminum Drip Pans and so if you are considering ordering the Q100 grill online, it is recommended you purchase some extra Weber 6415 Aluminum Drip Pans with your Q100 gas grill order. Also the cast aluminum grill body has drip ducts too. To finish off the cleaning process, we would recommend a Weber Grill Brush and Scraper. This tool upholds the Weber reputation of being the right tool for the job. There are 2 options, a 12″ Weber Grill Brush and Scraper, where the overall brush length is 6” smaller than its Weber 18” Grill Brush and Scraper sister. The 12” smaller brush means it does the job while taking up less space in the trunk. Customers report that the brush has lasted them well through the summer of grilling 2 to 3 times a week, with bristles being a suitable length to get in between the grill slats to remove the burnt on food. Some customers have expressed a preference for the extra 6” of the 18” brush scraper, since the extra length means that if you are using the brush while cooking, your hand is not so close to the heat. If you prefer, instead of considering the Weber Q120 (which has fold-out side plastic tables already fitted), you can purchase add on side tables for your Weber Q100, using the Weber 6502 table kit. This kit contains 2 tables which connect to either side of the grill using supplied screws (it takes about 2 mins to connect them) and they fold into the grill for storage purposes (ensure your grill is cool first though!). The tables don’t add significantly to the overall weight of your grill, have hooks for the handy storage of your grilling tools, and each can hold a plate, your bbq sauce, or even your salt and pepper shakers! Keep your Weber Q 100 grill looking great, and ready to go in an instant. So now we have eaten our desert, the grill has cooled down and been cleaned, its storage time for your grill. 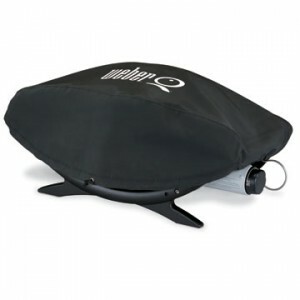 We would recommend considering a tailored Weber 6550 Vinyl grill cover which has been designed specifically to fit the Weber Q100 nice and snug. A cover is very worthwhile investment as it keeps the grill looking great, and means it’s ready to grill at a moment’s notice and will protect your grill from dust. What’s the difference between the Weber Q100 gas grill and the Weber Q120 gas grill? The main difference Weber Q100 grill and the Weber Q120 gas grill is the Q120 includes the 2 side fold out tables and has an electronic ignition, and has a taller lid space than then Q100. The Q100 does not include a lid thermometer, but the Q120 gas grill does. Both models have the same 8,500 BTU. The Q120 costs an additional approx $40 compared to the Q100. What’s the difference between the Weber Q100 gas grill and the Weber Q140 grill? The Weber Q 100 grill is gas fueled, the Weber Q140 is electric powered (hence the Q140 does not have an ignition button). 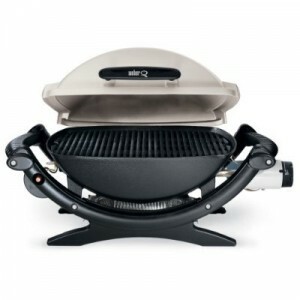 The Q140 electric grill has stainless steel grates (the Q100 has cast iron). They both have 189 sq inches of cooking space. Neither have a lid thermometer. They both are the same width and height, but the Q140 is just under 5 inches deeper than the Q100 gas grill. The electric Q140 is approx $90 to $100 more expensive than the Q100. What’s the difference between the Weber Q100 gas grill and the Weber Q200 gas grill? The Weber Q200 gas grill is bigger than the Weber Q100 grill, both in terms of cooking heat and size. The Weber Q 100 portable grill has a BTU pr hour of 8,500, the Weber Q200 grill has 12,000 per hour. The Weber Q200 gas grill is approximately 3 inches longer, deeper and higher (in all directions) than the Weber Q100. Neither model has a thermometer in its lid, but the Weber Q200 gas grill does include the side tables (the Weber Q100 does not). The Q200 gas grill costs approximately $50 more than the Weber Q100 grill. What’s the difference between the Weber Q100 gas grill and the Weber Genesis gas grills? 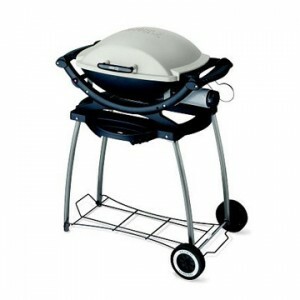 The Weber Genesis range of grills, such as the popular Weber Genesis E320 gas grill, are much larger grills. The Genesis series of barbecues are standing grills that are not designed to be mobile, and have 3 main gas burners. These features compare to the mobility features incorporated into the Weber Q100 grill – such as its compact size and single main gas burner. The Weber Q100 gas grill does prove that great things come in small packages. The Q 100 gas grill is highly portable, lights quickly, has a suitable grilling area to cook for approximately 4 people, and incorporates the quality build and features that Weber grills are renowned for. All of this with great accessories at a very reasonable price, it’s very easy to see why the Weber Q100 gas grill is so popular.